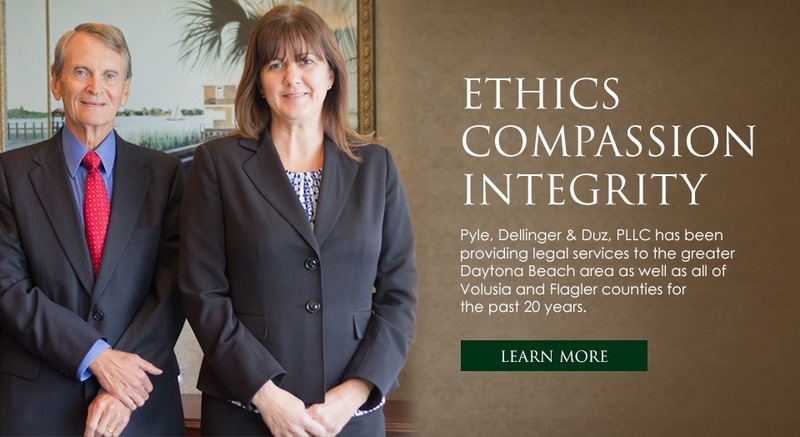 Pyle, Dellinger & Duz, PLLC has been providing legal services to clients in the greater Daytona Beach area, as well as all of Volusia and Flagler counties, for the past 20 years. We are dedicated to providing our clients with the highest level of service. Ethics, compassion and integrity are core values of our practice. All of our Daytona Beach Attorneys and staff are also diligent, reliable, friendly and professional. We insist on taking the time to carefully address all of your concerns and pride ourselves in making sure you understand all possible outcomes to your decisions. Our attorneys handle legal matters for both businesses and individuals in the following areas: Estate Planning, Wills and Trusts, Probate, Guardianship, Real Estate, Title Insurance, Elder Law, Condominium Law, and Corporate & Business Law. At Pyle, Dellinger & Duz, PLLC you can expect the results and resources of a large firm with the personalized touch and individual attention of a small firm. Our firm is committed to excellence. We are proud that the majority of our clients come to us as the result of referrals and repeat business. We pride ourselves on our attitude, experience and systems for handling legal matters efficiently and at a reasonable cost. We strive to provide the best possible services to our clients, and we believe we are successful in doing so.